At Superior Playgrounds, we only use quality playground materials — whether you’re talking about a steel playground structure or a recycled playground structure. Produced at our west Georgia manufacturing facility, all of our recycled and metal playgrounds are proudly made in the USA. You can trust that each and every playground is built to last and will provide fun for years to come! We use 30% recycled galvanized steel posts and tubing. For each stainless steel playground, we use galvanized steel for all steel posts and tubing for maximum strength and durability. Both the interior and exterior of all of our galvanized steel parts have been through the Triple Flo-Coat® process to ensure greater corrosion resistance. All galvanized steel posts and tubing are 95%–98% recyclable. Our posts are available in two size options to meet your design and budget needs. We offer the look and feel of wood without the unwanted maintenance. Our 100% recycled (excluding additives and colorants) HDPE posts are made from both pre-consumer and post-consumer plastic, like milk jugs and detergent bottles! Every pound of our recycled plastic lumber equates to eight recycled milk containers. Neat, right? We ensure our recycled posts are reinforced for even greater strength by adding additional fiberglass elements to each post. Our posts are vandal resistant and protected from rotting, splitting, cracking or splinters for a minimum of 50 years. Additionally, the posts have minimal fading and are resistant to termites, marine borers, salt spray, oil and fungus. Our textured high-density polyethylene is strong and UV stabilized. Our strong ¾ inches thick, textured high-density polyethylene material is used for our activity panels, signs, tables and even some of our climbers! With UV stabilization, we ensure your carefully selected color will remain bright and colorful for years to come. Additionally, these panels are stain and graffiti resistant and will not splinter or crack. Our rotationally-molded plastics have anti-static inhibitors. Our rotationally molded plastics, such as those used for slides and tubes, are made of ⅜ inches thick low-density polyethylene (LDPE). Not only are our rotationally molded plastics UV stabilized for reduced fading, they also contain anti-static inhibitors. Strong and durable, components made of this material are ready to withstand many long days at the playground. Our Superdurable powder coat leaves your structure protected. Initially blasted to a white condition to remove all surface rust and oil, our steel playground frames are coated electrostatically with an epoxy TGIC powder coat zinc-rich primer, which has been salt spray tested for over 4,000 hours to ensure quality. After the primer application, we apply a Superdurable polyester TGIC powder coat. 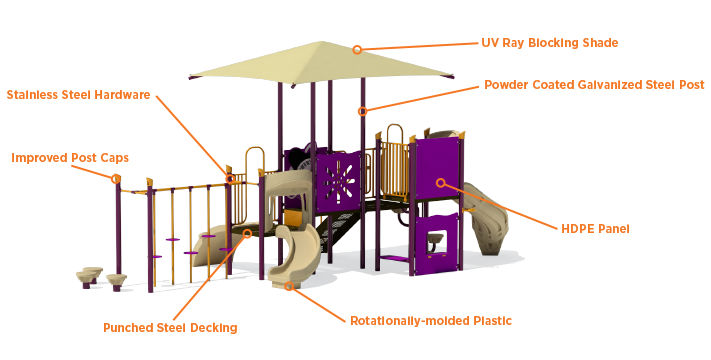 After the application of the final coat, a total of 6 mils of finished powder coat has been applied to your product, leaving your playground protected from the sun. We offer stainless steel hardware so you won’t worry about rust. 99% of the hardware we use is stainless steel, with less then 1% of our hardware being corrosion-resistant coated steel. Our hardware is mostly vandal resistant, keeping your playground safe from tampering. Additionally and depending upon your design, we provide security patches to ensure screws lock into vertical pipes. Our hardware is packaged individually and labeled allowing for more efficient installation. Our steel decks and stairs are the thickest in the industry. Our steel decks are formed from 12-gauge hot-rolled steel body — the thickest in the industry — and coated with UV stabilized PVC (plastisol) coating for a softer play surface. Additionally, they’re sprayed with X-Tuff, a PVC textured coating that increases foot traction and support. Our decks are perforated for great drainage, are lead-free and have formed sides that are welded with reinforcements for an even stronger deck. Post caps provide many great benefits. From easy in-field installation to a unique two-color look, our aluminum alloy post caps offer many great benefits. Our super-tough post cap design allows for less water access, making our posts more durable in the field. Once installed the post caps can't be removed, stopping unwanted vandalism. We keep your children cooler and protected. Our shade fabric blocks 91%–99% of harmful UV rays, depending upon the color you’ve chosen to accompany your play structure. Our UV stabilized fabric is created from high-density polyethylene and Raschel knitted to resist fading, abrading, rotting, shrinkage and unraveling. The fabric is also flame retardant, with some of our 12 color choices being California Fire Marshal certified. For more information and additional details about our materials, check out our general specification information here.